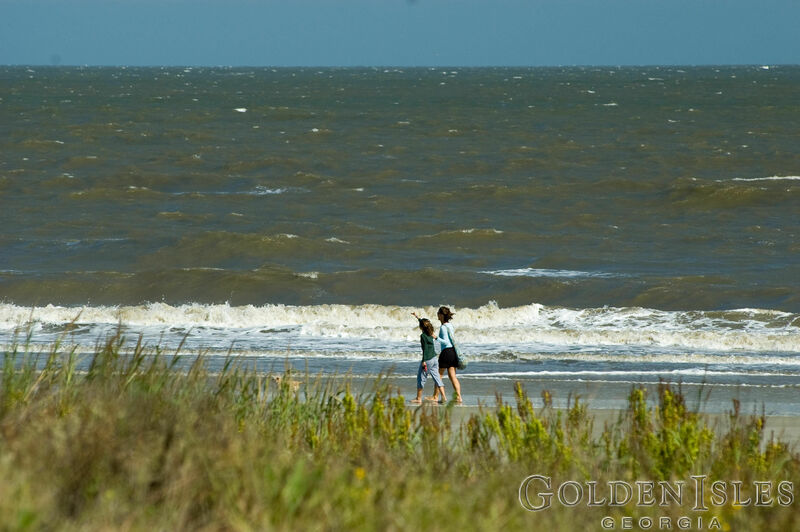 One of Georgia’s best kept secrets – its four southeast coastal barrier islands referred to as the Golden Isles – contains a seaside haven perfect for your family’s next beach vacation. 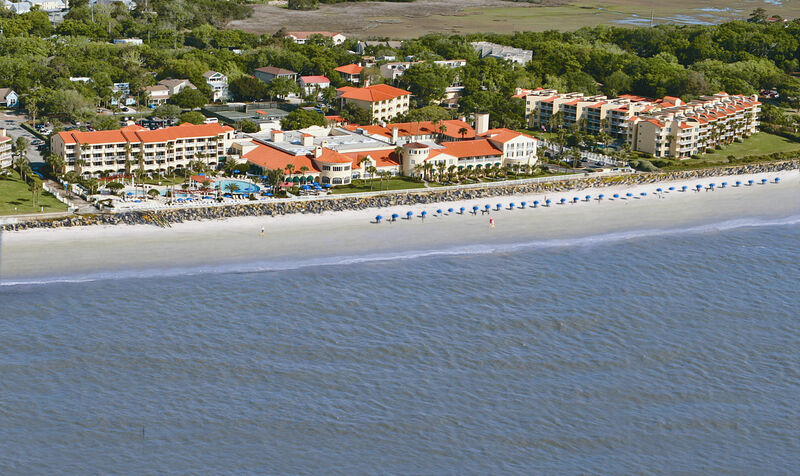 The King and Prince Resort on St. Simons Island, the largest of the Golden Isles, is St. Simons’ only oceanfront beach resort and offers an array of activities infused with typical welcoming Southern hospitality. St. Simons is a wonderful, family-oriented community located across a five-mile causeway from Brunswick, Georgia. During our four-day stay at The King and Prince we were treated like old friends by, not only the attentive resort staff, but by everyone we met throughout the island. We didn’t simply feel like tourists being welcomed for their business; but rather we felt welcomed as guests of the island community, invited to share in the tranquil beauty of this quaint island. In 1935 a small, private seaside dance club, The King and the Prince, opened on the picturesque beach on St. Simons Island. From this humble origin, The King and the Prince has become a prized destination for visitors looking for a warm Southern welcome in a beautiful seaside setting. The King and the Prince is listed on the National Register of Historical Places and is a member of the prestigious Historic Hotels of America. 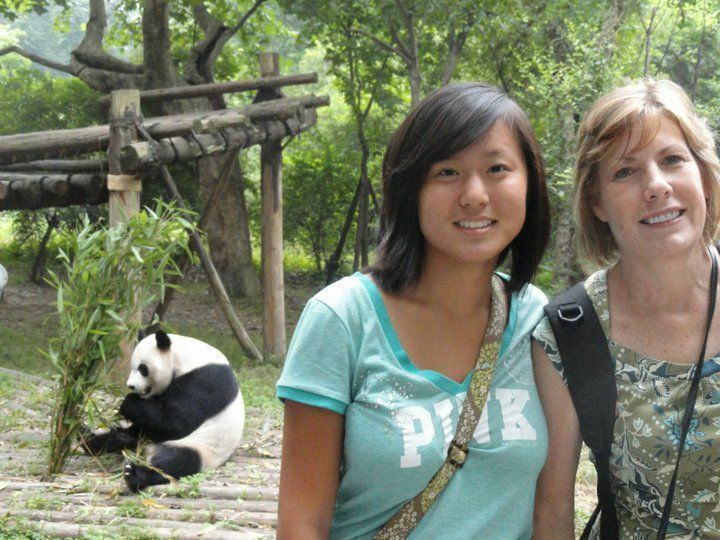 But don’t let this impressive pedigree scare you into thinking that the resort is not for families. The King and the Prince has been welcoming families for generations to its casual and gracious hospitality. The King and Prince Resort recently redesigned its pools to create an impressive array of three tropical-themed pools directly adjacent to the beach. With two separate children’s pools and a large sandy play area, kids will have a blast. An indoor pool and hot tub is available for those rainy or cool days. The resort’s Activities Coordinator keeps things hopping all summer and on school holidays with a variety of pool and beach games and activities. Family members that golf will revel in the beauty of The King and Prince Golf Course and its four spectacular, marsh-framed “island holes.” Although we don’t golf, we toured some of the course on a golf cart and marveled at the uniqueness and beauty of these signature “marsh island” holes and immaculate fairways lied with towering oak trees draped with Spanish moss. Children accompanied by adults are welcomed to play the course. Tennis buffs will find two beautifully maintained Har-Tru courts available complimentary to guests. Maybe mom and dad can find some “me” time and enjoy one of the many treatments offered in the Royal Treatment Cottage, the resort’s full-service spa. Accommodations at The King and Prince are quite varied, with many rooms and suites having ocean views. Families can spread out in the two- and three-bedroom villas, which offer full kitchens and spacious living areas. Families will not only have lots to do at the resort but throughout the island. We began our exploration of St. Simons with a Trolley Tour to learn of its interesting history and to take in the beauty of the island. Lighthouse Trolleys offers a great 2-hour tour as well as a wide variety of other tours including dolphin tours, sunset boat cruises, trolley ghost tours and ½ or full-day fishing trips. Our affable tour guide, Cap Fendig, can arrange an inshore, nearshore or offshore fishing trip for you and your family. A more comprehensive listing of fishing charters is available at the Golden Isles website. 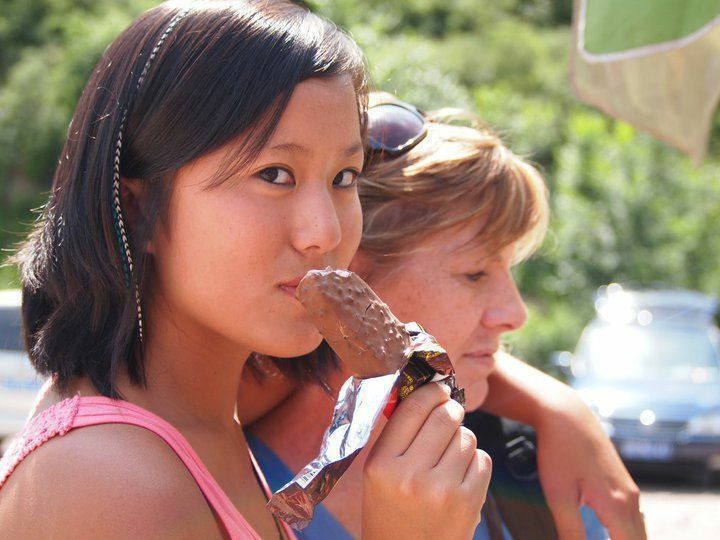 The island’s Coastal Outdoor Adventure Camps offer a variety of fishing, marine, and outdoor activities for kids. Some of the camp themes include shark fest, beach camp, and camp village creek for a week-long adventure. These camps meet daily from 9am to 1pm. 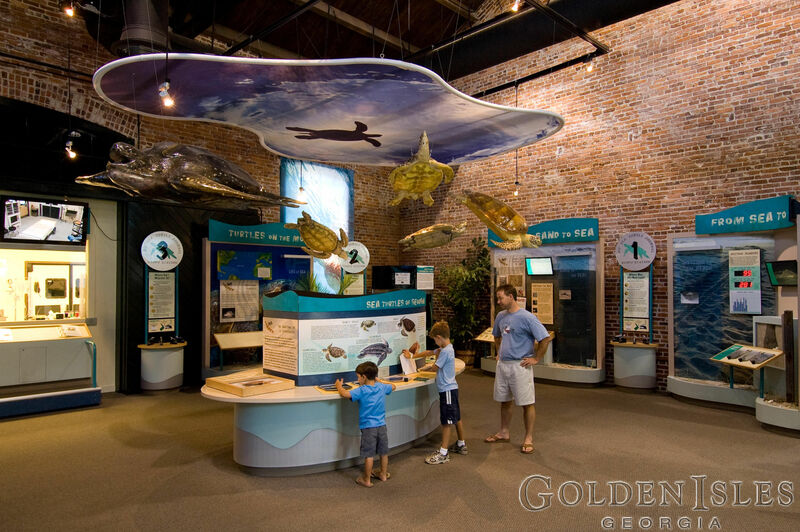 Also be sure to visit the St. Simons Island Lighthouse and Museum. We enjoyed climbing to the top of the lighthouse for some spectacular views of St. Simons, neighboring Jekyll Island and Brunswick on the mainland. With over 21 miles of bike paths, St. Simons offers families great opportunities to get a little exercise and enjoy the beauty of the island. We spent one afternoon on bicycles enjoying some wonderful views of the marshes, beautiful homes and the beaches. When the tide is out, the beaches are perfect for riding bikes – something not possible on most beaches. Bike rentals are available at Ocean Motion, just one block from The King and the Prince. Ever dream of riding a horse along a picturesque beach? Well, visit The Stables at Frederica and book a Beach Ride or a Wooded Trail Ride. Beach and Trail rides are by appointment only. Children’s Lead Around rides are also available. While we were biking we headed to Pier Village to browse through some unique shops and restaurants but also to witness some family fun at the Neptune Park Fun Zone. This park contains a children’s pool and waterpark with an area containing slides, water spouts and canons – perfect for small children. There is also a wading pool, lap lanes, and shaded lounge chairs. 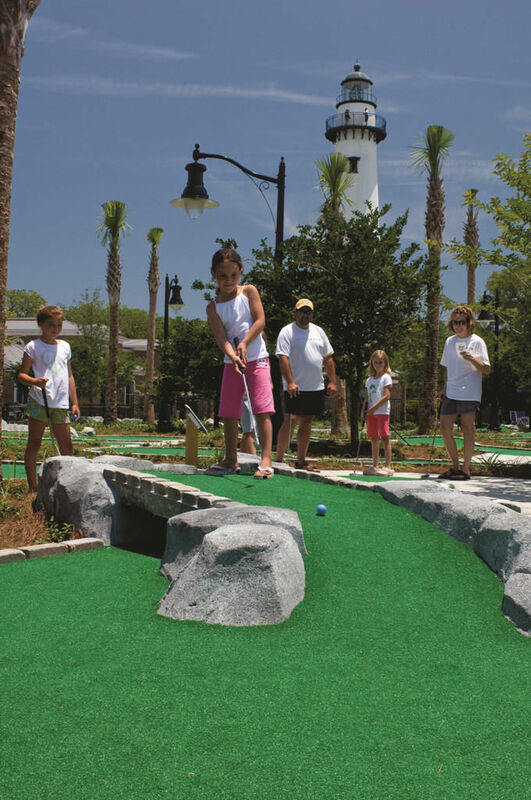 A miniature golf course and the village fishing pier is also located in Neptune Park. 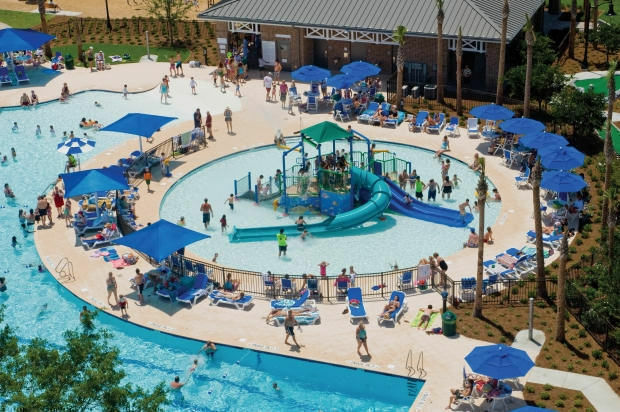 For a little more intense water park, you can visit Jekyll Island’s Summer Waves Water Park (912/635-2074) – just a short drive from St. Simons. If you do go to Jekyll Island, you may want to check out the Georgia Sea Turtle Center, a rehabilitation, research, and education facility that provides emergency care to sick and injured sea turtles. Turtle lovers should note that Ocean Motion also conducts kayak nature tours and dolphin nature tours, as does Southeast Adventure Outfitters. Kayaking is a great way to explore the vast marshlands and winding creeks of St. Simons. Kids will love going shrimpin’ aboard the Lady Jane, a 60-foot steel hull shrimp boat that trawls the protected inland waters of coastal Georgia. It is great fun to watch the crew pull up the nets and dump the catch on board. Then they sort through the many species of marine life, explaining what they have caught and allowing passengers to handle many of the species. You can even chip in and help remove the shrimp heads as the crew prepares the freshest shrimp boil you’ve ever had, using the sweet Georgia white shrimp that these coastal waters are famous for. What a scrumptious ending to an enjoyable cruise aboard the Lady Jane. For some local St. Simons history and culture visit the Maritime Museum at the Historic Coast Guard Station at East Beach and Fort Frederica National Monument, built in 1736 as the center of defense for the English colony of Georgia. Dining at The King and Prince is a treat sure to please even the most discerning of culinary enthusiasts. A major focus of the dining team is the inclusion of Georgia products on the menu, from the sweet Georgia wild shrimp to Plantation Vodka, Midnight Moon Moonshine, Savannah Bee Honey, and Lane Peaches. A few “don’t miss” selections are the Georgia peach cobbler, Shrimp and Grits in Tasso Cream Sauce, and the truly authentic Southern Low Country Boil with such ingredients as Georgia shrimp, blue crabs, sausage, potatoes and corn. 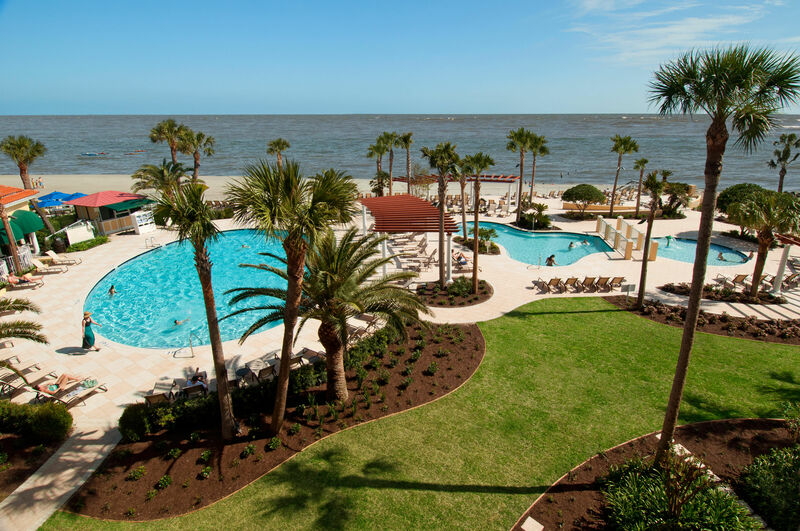 Families will find in Saint Simons Island a quaintness and friendliness that will make them feel like they have come home – even if they are not down-home Southerners.